Last modified on April 23rd, 2018. 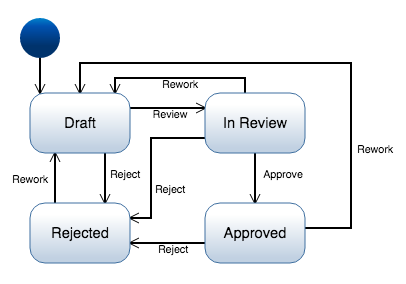 Innoslate's workflow controls allow an entity's status to be transitioned through a lifecycle. Workflow has the ability to control permissions of the transition, locking, and to generate custom notifications. Innoslate includes a standard requirements and issue workflow with every project. These default workflows are based on CMMI (Capability Maturity Model Integration) and are designed as a starting point. The default workflows can be changed to suit your project's needs. A new class can be added to workflow by clicking the 'Add Workflow Class' button. Any class with an enumeration attribute can be added to a workflow. A transition allows controlling the entity's state. Click the 'Add Transition' dropdown and select the state you would like to transition to. Any user or team can receive a notification when a transaction is reached. Multiple users and teams can be added to the notification list. Click 'Select user/team' under 'Notifications' to add a user or team to the notification list. By default all users have permission to transition from one state to the next. Innoslate allows restricting transitions to specific users and/or teams. To restrict a transition, 'Select user/team' under 'Permissions' to add a user or team. Once a final state has been reached (ex. closed/approved), an entity can then be locked from editing. To lock an entity at a transition check the 'Locked' checkbox. Entities can be unlocked by project owners in database/entity view. Innoslate’s workflow controls allow an entity’s status to be transitioned through a lifecycle. 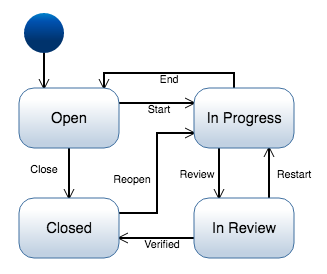 Workflow has the ability to control permissions of the transition, locking, and to generate custom notifications. Innoslate includes a standard requirements and issue workflow with every project. These default workflows are based on CMMI (Capability Maturity Model Integration) and are designed as a starting point. 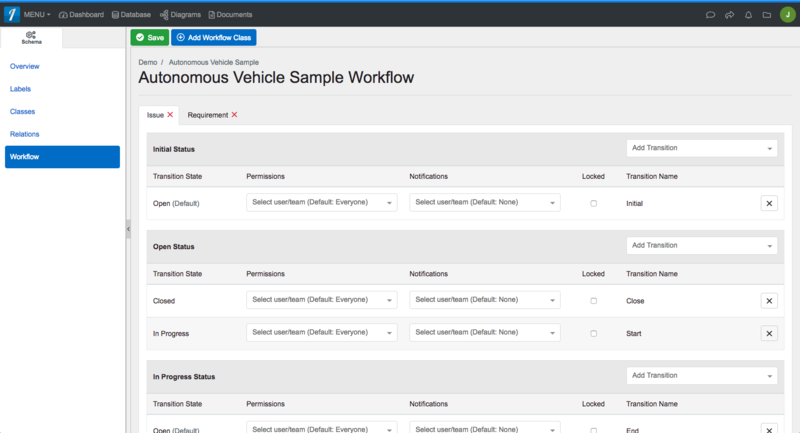 The default workflows can be changed to suit your project’s needs. A new class can be added to workflow by clicking the ‘Add Workflow Class’ button. Any class with an enumeration attribute can be added to a workflow. A transition allows controlling the entity’s state. Click the ‘Add Transition’ dropdown and select the state you would like to transition to. Any user or team can receive a notification when a transaction is reached. Multiple users and teams can be added to the notification list. Click ‘Select user/team’ under ‘Notifications’ to add a user or team to the notification list. By default all users have permission to transition from one state to the next. Innoslate allows restricting transitions to specific users and/or teams. To restrict a transition, ‘Select user/team’ under ‘Permissions’ to add a user or team. Once a final state has been reached (ex. closed/approved), an entity can then be locked from editing. To lock an entity at a transition check the ‘Locked’ checkbox. Entities can be unlocked by project owners in database/entity view.